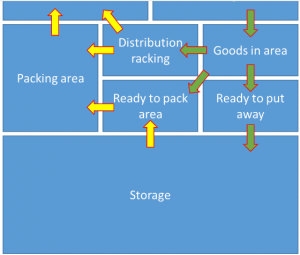 Warehouse layout – Getting the best from Warewolf? Stock taking. Reviewing what inventory you actually have. If your business has very few SKUs or perhaps operates from a store where goods out orders are fulfilled from shop inventory, then you may not use warehouse locations. For even slightly more complex operations, the use of warehouse locations can improve productivity considerably. Of course, as your SKU count and volumes increase, the use of warehouse locations usually becomes vital. An efficient warehouse layout strategy needs to balance some of the bullet points above. Here are some ideas that you may find helpful when implementing or redesigning your location plan. Fast selling products should be located on the shortest route between receiving and goods out areas. Be mindful that having too many fast sellers next to each other could cause congestion with two or more people trying to pick close to each other. Heavy items are usually best located near the ground particularly where your team picks manually. Leave empty locations here and there to allow for storing new lines which are expected to be fast sellers to be slotted in. Where space restrictions make it impractical to keep empty locations in ideal areas, then simply store the same SKU in more than one location, Warewolf deals with that. One location per SKU would be operationally nice but may not be practical. For example, footwear and apparel vendors who have many sizes and colours to manage. The key is to have few enough SKUs in each location for a picker to sort and find what they need quickly. Relocate out of season inventory to more remote warehouse locations. Warewolf supports a 5 level location naming hierarchy. The names of the levels from big to small are zone, aisle, bay, shelf and bin. Of course, it may not be necessary in your organisation to use all five levels. You have decided on a good warehouse layout. Now, your team will need to know where they are in the warehouse and where they need to go quickly. This is especially true where you use temporary staff who are less familiar with the layout than your regular team. Location names should appear on an identifying barcode ticket and will take the format Zone.Aisle.Bay.Shelf.Bin. Since barcode print space is limited, keep names for each level very short; ideally to one or two character. For example, the location name Racket Sports.Tennis.Rackets.Junior.Aluminium would simply not fit a barcode label whereas A.1.F.N.12 would. It follows that location names should be assigned logically following walkways through the warehouse. Bear in mind that Warewolf presents locations in alpha-numeric order for pick lists, put away notes and stock takes. If in practice you decide to use just part of the hierarchy, simply give the value 0 to unused levels. We recommend inserting location barcode labels into protective pouches to stop them becoming damaged. Mostly, pouches are magnetic or self-adhesive in various sizes. Ensure that the pouches you procure allow barcodes to be read through them. Finally, attach pouches to shelving in convenient places for scanning and be consistent so as to avoid confusion over which shelf the location barcode refers to. Depending on the nature of their businesses, Warewolf customers typically create a receiving area where cartons and packets are received from suppliers and from customer returns. Warewolf enables large purchase order deliveries to be processed a few cartons at a time and clients usually find that they need less warehouse space for this part of the goods in process and can gain greater team productivity. For most clients, it makes sense to designate racking close to where goods in packages are processed to immediately set aside inventory to satisfy customer orders awaiting stock and for distribution to retail units and secondary warehouses: Often known as cross docking. The block layout below supports the core Warewolf goods in process, the green arrows. In doing so, Warewolf minimises handling and thus mistakes, minimises time between goods in and goods out and provides an orderly means to put away inventory balances. Warehouse layout for goods out processing. Inventory for goods out is sourced from warehouse storage areas and distribution racking, the yellow arrows. For inventory assigned to goods out from storage areas, this is a two stage process. Picking goods from storage then packing for customer delivery or transfer. Where Warewolf batches are used for picking and packing, pickers are assigned batches to process. They select an empty cart and go around the warehouse picking the goods required for the batch. On completion, pick carts may be left in the ‘ready to pack’ area for the packing team. Of course, the picker may also immediately pack the batch in which case he/she will take the cart directly to the packing area. Inventory in the distribution racking area may need boxing up or caging ready for shipping. If already caged or boxed then there is no need for this inventory to pass through the packing area. Packing station arrangements are largely dictated by your goods out process. In particular, the point at which you print packing labels (if you do). 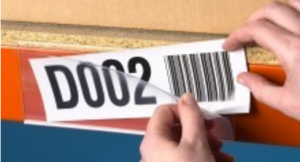 Normally, packers print at the point the goods out note or the last product in the consignment is scanned. In which case, fixed work stations are likely to be most appropriate.